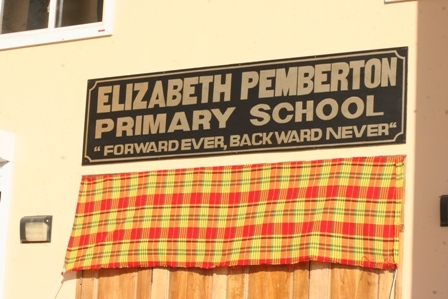 CHARLESTOWN NEVIS (April 08, 2010) — The Elizabeth Pemberton Primary School was the new name given to the St. Johns Primary School, in memory of Mrs. Elizabeth “Teacher Lizzy” Pemberton, a noted educator who had served the St. Johns Community before her passing. The unveiling ceremony took place at a moving ceremony at the Flats on March 29, 2010. 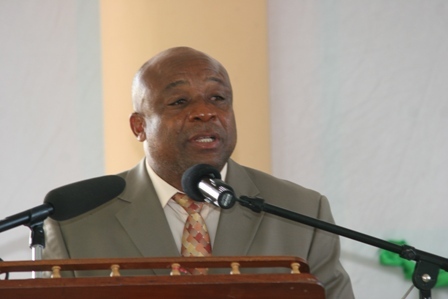 Deputy Premier and Minister of Social Services in the Nevis Island Administration (NIA) Hon. Hensley Daniel unveiled the school’s new name with Mrs. Averil Griffin Charles, a close relative of Mrs. Pemberton. The event was hosted by the Department of Social Development in collaboration with the Ministry of Education. In his remarks the Minister Daniel said the name change was symbolic of the Nevis Island Administration’s mission to recast the society in the image of local persons who had contributed selflessly to the development of Nevis. 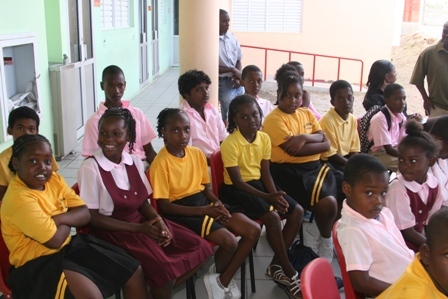 The school is the third facility to be renamed on Nevis since the announcement on National Heroes Day 2009, that six public buildings and places would be renamed after seven local heroes. “We have come to celebrate the life and times of Mrs. Pemberton but more importantly, to ensure that her work is indelibly stamped somewhere in Nevis and we have chosen the new school here at the Flats. “We have come to make sure that today’s generation have a very good understanding of the real people in the society… We are conducting these ceremonies to recast the society in the image of local people at a time when it is absolutely important to ensure that this and succeeding generations bear in mind the people who went beyond the call of duty to help those in need,” he said. According to Mr. Daniel, Mrs. Pemberton had made a sterling contribution to the academic and social life of the residents of Cox, Cole Hill, Beach Road, Pond Hill, Brown Pasture, Burden Pasture, Morning Star and Church Ground and he said the honour bestowed on her in 2010, though after her passing was well deserved. “We are celebrating the life of a woman who was the epitome of decency, good manners, respect and discipline. We are celebrating her because we want today’s generation, especially the students here to know that they have a responsibility to emulate Mrs. Pemberton. “As such, the students here must at all times and I repeat, all times show good manners, respect, discipline and hard work because these ideals were synonymous with the work of Mrs. Pemberton,” he said. He stressed the need for Christian Education to remain a part of the school’s development since Teacher Lizzy was a committed Christian who would have wanted each student to uphold those Christian values. Mr. Daniel noted that the celebration of Mrs. Pemberton came at a time when persons of high moral and spiritual values were being challenged to join the crowd to make easy compromises with evil. He contended that that occurrence was because genuine goodness threatened those at the opposite end of the moral spectrum. The Minister spoke of the School’s rich heritage and pointed to a number of persons who had passed through the institution of learning and were taught by Teacher Lizzy who had gone on to become successful professionals in the Nevis community. “I find it difficult sometimes, the way our young people behave continue to suggest to me that they have not been told enough by the older people in the community. I am urging the adults to make sure that our children know their history and know from whom they came and know the people who have made that significant contribution to their development,” he said. The Minister also had words of wisdom for the current students and explained to them that Teacher Lizzy who the school was renamed after was one who taught with zeal and made every effort to help others. He said she won the love and respect of the entire community and they had a duty to approach their school years with a sense of purpose. He said she was one who fed the hungry, clothed the naked, taught those who were unteachable and gave her life to the service of others. “Teacher Lizzy understood that when you give someone your time, you are giving them a portion of your life that you will never get back. She valued people enough to give them her most precious asset – her time. “Teacher Lizzy was a caregiver who loved God by loving others and meeting their needs. I think Teacher Lizzy was cut from the same cloth as Mother Theresa… She slept and dreamt that life was joy. She woke and saw that life was all service. She served and saw that service was joy,” he said. 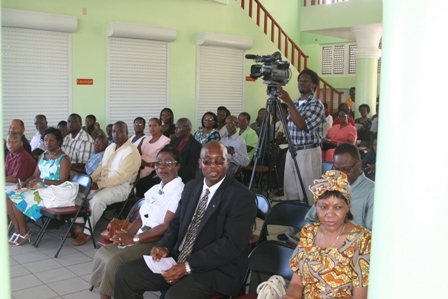 The Social Development Minister urged the family and community to continue to uphold the ideals of Mrs. Pemberton citing that though she had passed, “not even the sod of the cemetery can keep her incommunicado because a single thought, a single idea and a single remembrance of all her work will sustain both us and her,” he said. 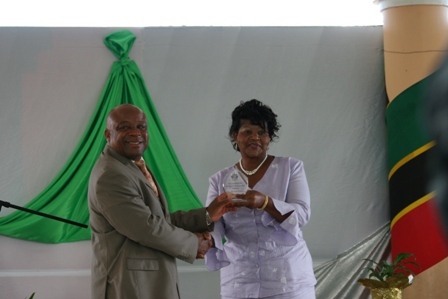 Mr. Daniel also presented a crystal plaque inscribed with the honour bestowed on Mrs. Pemberton for her contribution to the Development of Nevis to Mrs. Averil Griffin Charles. To date the NIA has renamed the Netball Complex in honour of Mrs. Cicely Grell-Hull and Mrs. Dora Stevens; the St. Thomas Pre School in honour of the late Mrs Inez Franc and the Treasury Building in honour of Mr. Arthur Evelyn.